A cold spring and wet summer could spell a ragweed season full of sniffling, sneezing and watery eyes for allergy patients in Kentucky and Indiana this year. Many weather experts are saying this autumn could be the worst we’ve seen in many years. Fall pollen counts are getting higher each and every year. It doesn’t help that Louisville, Kentucky was ranked the worst city for allergies in 2014, according to the AAFA. Ragweed season begins in August when it first blooms and releases pollen; the season may last until November, with peak counts usually occurring in September. Pollen is dispersed by the wind and because the grains are very fine and light, can remain airborne for days and may travel hundreds of miles. Pollen counts are highest on warm, windy days, and between the hours of 10 AM and 3 PM. They tend to be lowest on cool, wet days. Hay fever affects between 10-30% of the population; symptoms include stuffy or runny nose, sneezing, itchy eyes and throat, and hives. Some individuals experience coughing, wheezing, and breathing difficulties. People with ragweed allergies may suffer from a related food allergy known as oral allergy syndrome, which causes itching, burning, and swelling in the mouth and throat when certain foods are ingested. Bananas, cantaloupe, melons, beans, potatoes, celery, cucumbers and other foods often trigger these symptoms. 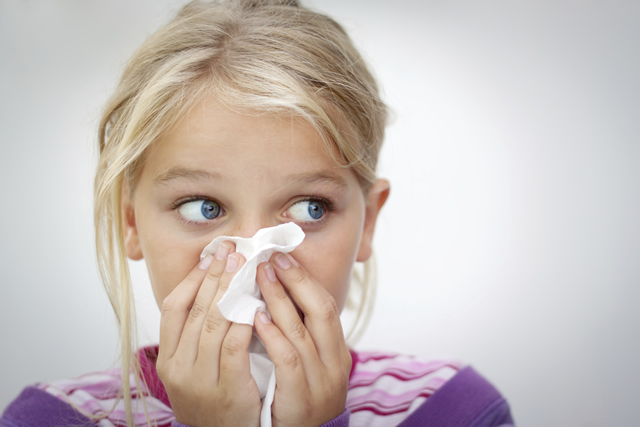 Treatment for ragweed allergies includes over-the-counter antihistamines and decongestants and nasal steroid sprays. Those whose symptoms do not respond to medications may want to undergo allergy testing in order to confirm they are allergic to ragweed; once this is verified, immunotherapy (allergy shots, drop or tablets) may be an option for long-term control.